Built in the mid 15th century, it is possible that today’s Gothic hall church with equally high chancel and nave replaced a former Romanesque basilica. As a rarity in the Transylvanian fortified churches, the church in Șoarș bears the remains of a jube at the base of its triumphal arch. The jube used to separate the chancel from the nave, just like the iconostasis separates the altar from the naos in the orthodox churches. The gallery, accessible by stairs, was the place dedicated to lectures on religious topics. The fortified church still preserves the in the meanwhile lowered bell tower, but lost its defence wall, which was dismantled in the 20th century, the resulting material being used for the building of the in the meantime ruinous school. A fortified house formerly used as granary is preserved on the southern side. 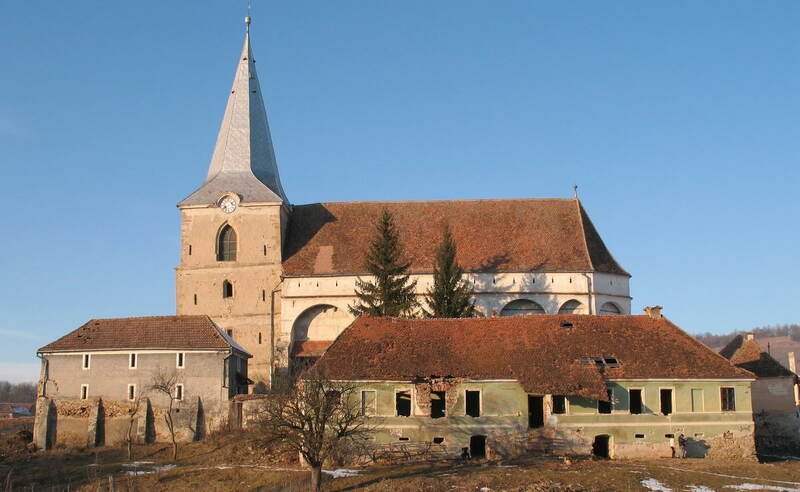 Already mentioned in a document from 1206, Șoarș is one of the oldest settlements in Transylvania. Located in the middle of crop areas, which colour its surroundings in thousands of shades, the name does not suit the village at all. It derives from the Hungarian “saros”, which can be translated as “muddy” or “swampy”. Even though centuries ago swamps might have been located here, they disappeared long time ago under the fields and meadows. Weaving, as craft and art, played an important role in the past of the village. During the summer, sheep were sheared and, according to their breed, a softer or a more coarse kind of wool resulted. The wool was first washed and sorted according to its colours, then carded, placed on the spinning wheel, manually rotated and spun on the spindle, and later made into a ball of thread. Technical skills met then imagination and diligence, and these three generated warm sweaters, waistcoats for pampering the loins, comforters for sensitive necks and all kinds of gloves.